The Swedish composer, conductor, violinist and painter Hugo Alfvén belonged with the Danish composer Hakon Børresen to the circle around the Skagen painters. From 1912 until 1936 Alfvén was married to Marie Krøyer, who had previously been married to the painter P.S. Krøyer. Hugo Alfvén is buried in the churchyard in Leksand – close to Marie Krøyer. Hugo Alfvén, along with Wilhelm Stenhammer, was one of his time’s most significant Swedish composers. Alfven’s music is Late Romantic in character and is often typified by a technically supe­rior use of the sonorities of the symphony orchestra. Many of Alfvén’s works have the character of programme music. They are colourful renderings of Swedish landscapes and moods: Dalarna,the Archipelago or the Swedish midsummer. 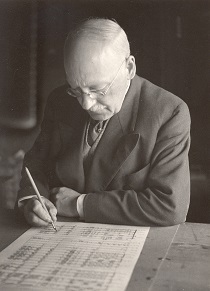 As a musician and conductor Hugo Alfvén was particularly active. As a conductor he toured most of northern Europe at the end of the nineteenth century. For almost forty years he was an honorary doctor and leader of the student Orpheus Boys’ Choir at the University of Uppsala. In 1954 Hugo Alfvén recorded a number of his works on LP. This was the first classical stereo recording in Sweden. What is perhaps Alfvén’s best known orchestral work Swedish Rhapsody no. 1, Midsummer Vigil (1903), was a huge hit in 1953 for the Canadian bandleader Percy Faith, and later also for the guitarist Chet Atkins. The easily recognizable, tuneful main theme has even found its way to Deep Purple’s Lazy from the Live in Japan album and an episode in Matt Groening’s cult series The Simpsons. Hugo Alfvén was not only active as a composer and musician. His abilities as a water-colourist made him consider a complete change of career at one point, and his autobiography in four volumes is particularly absorbing reading in the genre.